I know it's a little late but I just found it.. It's quite interesting to read his presser, kind of hoping there was a video too! Q. How pleased were you with today? RAFAEL NADAL: Normal. Well, is impossible be playing very well the first day, especially with -- sometimes if you don't have tough Roland Garros you can be here a little bit with more energy. I had tough Roland Garros this year. Even if only lost two sets the first day and one set in the final, I played very long matches, semifinals, and 3 hours 20 against Andy. So all the matches was tough and long. So the energy is not in perfect conditions right now, but I'm here to try my best, as usual. That help me, I hope, because I'm here because I love this tournament. It's one of the most fierce, the most beautiful of the world, I think, the center court. But at the same time it works for me to try, to start to have the feelings on grass. Sure, my conditions are not perfect because I feel everything like a little bit more tighter than usual. Q. Is this the toughest transition in the whole year from Roland Garros to here? RAFAEL NADAL: Yeah. More difficult one, especially if you play -- well, you play final in Roland Garros, you only have one day. The movements are so different. The muscles, you charge, you came from Roland Garros with a few muscles very tired, and you came here and you work not exactly the same muscles, so finally you have a little bit strange feeling in your body. Q. In a perfect world, how long would you like there to be between Roland Garros and Wimbledon? How many weeks? RAFAEL NADAL: The perfect world doesn't exist. So a perfect world doesn't exist in life, and for sure it doesn't exist in tennis. In a perfect world, we have to stop for three months at the end of the season, we have to have -- we supposed to have minimum one month and a half between Roland Garros and Wimbledon. In my opinion, Australia must be a little bit later, not that fast in the beginning of the season. That's also is impossible be happy with everything. But it's something that is like this, and I don't see a lot of solutions between Roland Garros and Wimbledon, because the weather is like this and you cannot play here earlier. If you play too late here, probably the weather can be dangerous. So for me, in a perfect world is better, is more important have more rest at the end of the season and play Australia a little bit later or Australia the same time but stop the season earlier. Between Roland Garros and Wimbledon I think is difficult to do changes. Q. A lot of people, Andy included, think there should be a Masters Series on grass, one Masters Series event on grass. Do you think that would be fair? RAFAEL NADAL: For sure would be fair. Is something that -- I will support that, because I love to play on grass. Q. When do you put it? RAFAEL NADAL: Exactly. When do you want to put the Masters Series? After Wimbledon, just after Roland Garros, just straight? So is big advantage for the rest. So the player who plays semifinals and final in Wimbledon or in Roland Garros are in very bad conditions to play next week in Masters 1000, no? Minimum, in my opinion, must be 500 tournament, you know, because with our calendar is obligatory play four 500, so we have to play almost for sure before Wimbledon one tournament. You can put one 500. Q. You were obviously in control today, but can you tell us what you thought of Matthew Ebden's performance? RAFAEL NADAL: I didn't know a lot about him. I think he came from the quarterfinal? He had a good tournament. I don't know. How old is he? 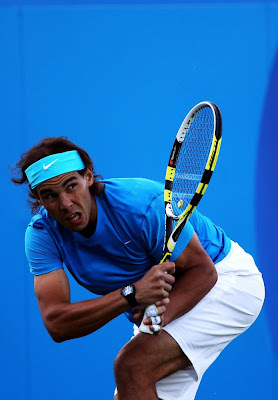 RAFAEL NADAL: We will see, no? I think he's still young and he have to keep improving and he will have his chances. Q. Andy said that he felt the court here was very slow compared to what he was expecting. He said maybe Paris was fast, but how did you find the courts for your adjustment? RAFAEL NADAL: I didn't have a lot of feelings yet. I only had one day for practice and one day of match. Seriously, my legs are not working enough well to test how fast is the court, because my movements are a little bit slower than usual. The focus on the ball is not yet at 100%, so to analyze a little bit more the conditions of one place, you have to analyze when you feel 100% to play. If you don't feel 100%, your vision not will be the correct one. Q. Can you tell us what you did in the 24 hours between winning in Paris and arriving here? What did you do, for example, on Sunday night? RAFAEL NADAL: Rest? No. So I finished so late, because I had to do a lot of press after Roland Garros. I arrived to my hotel probably at something like 10:40, and I went for dinner at 11:15. I stayed there -- I had to do some press there too with some Spanish writers. At 12:45 I came back to my hotel. I tried to sleep a little bit. Sometimes it's tough when you are very tired. RAFAEL NADAL: Nothing. No one. Q. No one? No one in your team had champagne? RAFAEL NADAL: No. Nothing of alcohol for sure on Sunday. To celebrate the victory I gonna have time later. I have to be focused on the grass court season. Q. Because you don't play on grass very much, does it make it more special when you do well in tournaments on grass? Q. Because you don't play on grass very often, is it more special for you to do well in grass tournaments and get to the final stages? RAFAEL NADAL: No. I love this surface, and I love the tournaments, not because I don't play a lot on grass. No, no. For sure make me happy play well in every place, but on grass always is a special feeling. Is a different surface than the rest, and you have to understand the surface. For me always play well on grass was makes me happy, because I know everybody talked in the past that my game gonna be very difficult for grass. I adapted my game well to play well here. That's a satisfaction, important. Q. Roger has received some criticism for pulling out of Halle. Q. Some criticism for pulling out. But the transition from clay to grass is so quick. Do you sympathize with his decision? Do you see why he decided to pull out? RAFAEL NADAL: Everybody's free to say anything, no? But you sometimes -- because some criticize will be from the press, no? You know, the press sometimes is nice to be there writing anything, but they didn't know how tough is play for long time in a row. You don't know how you're feeling physically, because I am very tired and I'm here. Probably he's the same, tireder than me and he lost the final. You know how tough is mentally, next day to start practice on grass. I think is -- it's not fair criticize that thing. Q. The criticism comes from the tournament officers, not from the press. RAFAEL NADAL: Anyway, is not fair from the tournament of Halle, in my opinion. I know sometimes it's tough for the tournament when big player -- I know how important it is for any tournament. Roger was very important in that tournament. He won few times. In my opinion, great champion like Roger, if he don't come to Halle this year is because his body is not enough fit because he knows for his preparation is better to play Halle than not play. So if he's not playing, is because he cannot play. He feels it's dangerous for injuries, is dangerous for his mental part. So I think is not fair. It happened to me in Vienna a few years ago and I was injured at home, and for me is more tough than for the tournament, don't go there, no? For Roger for sure will be the same. Was mistake from the tournament, in my opinion.